A favorite photo opt for frequent visitors, the Sullivan's Island Lighthouse helps anchor the Charleston County region's reputation as an inherently coastal destination, and continues to act as a guiding point to Charleston Harbor ships, Atlantic vessels passing along the coast, and visitors who want to light the way for a great vacation. By the late 1950s, the original Morris Island Lighthouse, located just south of the busy Charleston Harbor, was in danger of being destroyed by erosion, and after much debate, a community wide decision was made to build a replacement lighthouse on Sullivan's Island, just north of the harbor's entrance. Charleston, after all, was and still is one of the busiest ports in the Southeast, and the added beacon would only ensure that the passage from the Atlantic Ocean to the local ports would be smooth sailing. Construction began on the tower in 1960 and the lighthouse was completed in 1962, making it one of the "newest" lighthouses in the United States. Only the Texas Tower Offshore Lighthouses were built later, with construction starting on these offshore beacons in 1961 or so. The tower was originally painted in two shades: white and bright orange. After some complaints, however, about the glaring orange hue that could be viewed from almost anywhere in town, the orange was repainted to a more discreet black. While daytime visitors might not focus on the structure during the day, at night the lighthouse shoots out an unmistakable beam of light which consists of a 0.2 second flash, a 4.8 second eclipse, another 0.2 second flash, and a 24.8 second eclipse. Though exceptionally brief, nighttime beach walkers will have no trouble seeing the distant spark of bright light, and recognizing it as the unmistakable calling card of the Sullivan's Island Lighthouse. 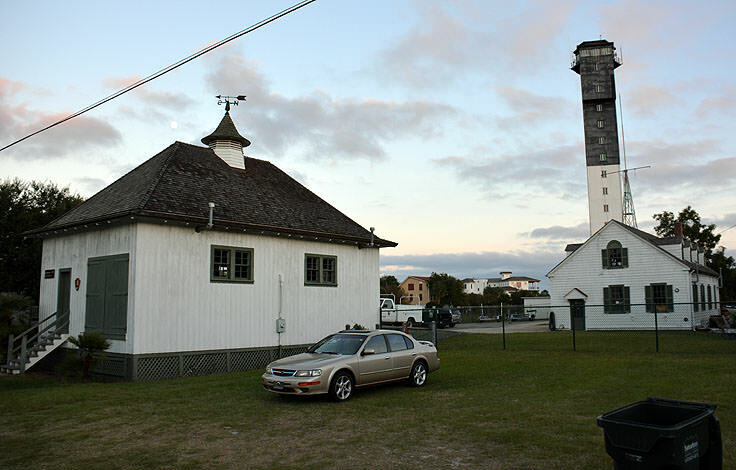 In 2008, the lighthouse changed ownership, and was transferred from the US Coast Guard to the National Park Service. 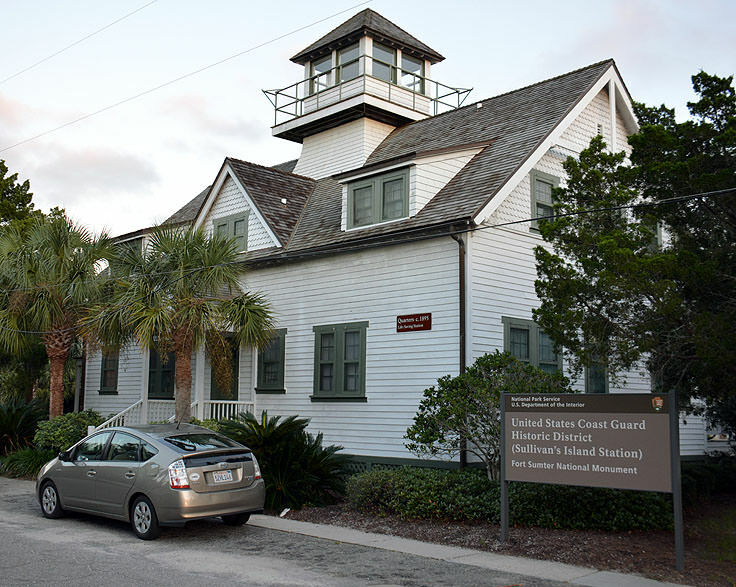 The Coast Guard continues to check and maintain the light itself, but the National Park Service ensures that the light maintains standing, and keeps its place as a local structure of historical importance. 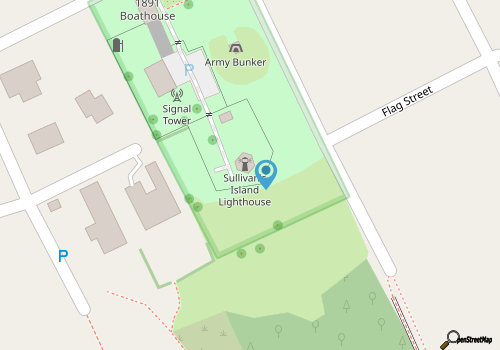 The lighthouse itself is fenced off and is not open to the public, however visitors are welcome to explore the surrounding grounds during the day to snap photos, and look up and admire the towering structure. 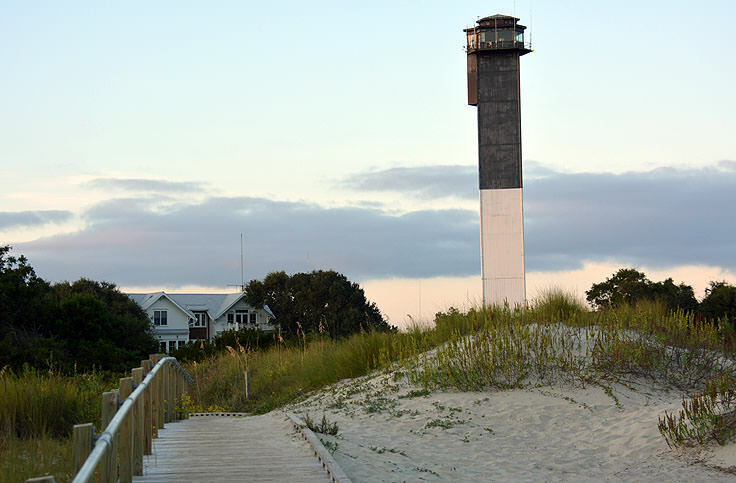 Sullivan's Island Lighthouse, which is located at the end of Station 18 half Street, also features a public beach access so strollers can capture some up-close shots of the structure towering over the sea oat-lined sand dunes. 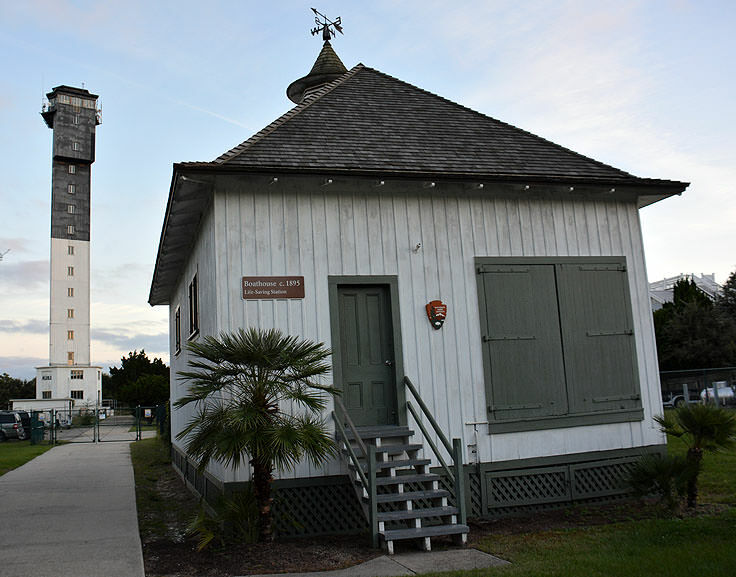 The historic Sullivan's Island Life Saving Station is also located nearby, just behind the main lighthouse entrance, and is certainly worth admiring for its historical coastal architecture and surrounding grounds of towering palmetto trees. The development of modern navigational systems in vessels of all sizes may have made the Charleston Light or Sullivan's Island Lighthouse somewhat functionally obsolete, however its historical significance to Sullivan's Island visitors is immeasurable. A favorite backdrop for regional and visiting amateur photographers, this logistically "new" lighthouse is just one aspect of a coastal culture that makes Sullivan's Island a genuinely unique vacation destination. Well loved and admired by locals and newcomers alike, visitors who want to enjoy a day off the beach exploring the sites, are advised to check out this triangular landmark that makes this small barrier island region of South Carolina notable and memorable for lighthouse lovers around the globe.